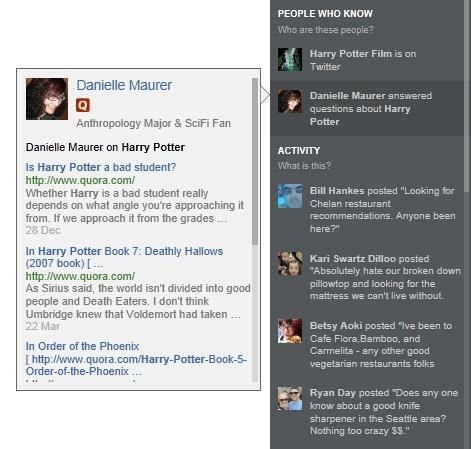 Google has silently begun to step back from surfacing your social media friends’ interests in its search results. Bing, on the other hand, has been moving full steam ahead. On Wednesday, Bing and Quora have announced a partnership that will incorporate Quora content in Bing’s social sidebar. From now on, anytime you search in Bing (assuming that’s something you do), relevant answers from your Quora friends, if you’re signed into Facebook, or Quora experts will appear along side the standard results. What Bing has in mind here is, searchers may find that an expert answer by a Quora user could provide a superior answer to Bing’s own search results. When a Bing user hovers over the Quora social sidebar result, answers to questions about the search topic by Quora “experts” will be listed. It’s a notable effort by Quora to brand itself as the de facto Q&A platform. Despite its name recognition among savvy Web users, Quora has yet to find its footing among a mainstream audience. Unfortunately, the social sidebar has a way to go before providing Bing users relevant Quora answers. When searching on Bing for answers to specific questions for which we’d typically turn to Quora, Bing appears to have a hard time providing social results at all. For simple single topic searches, including things like “technology,” Bing has no qualms with recommending a Quora user with answers to technology related topics. For complex questions, which are among popular topics on Quora including, “Should I incorporate in Delaware as a C-Corp,” or “What are the top music blogs,” no results are listed. UPDATE: A Bing spokesperson reached out to Digital Trends and explained the first iteration’s short comings. “As for Quora content not coming up every time you search for something, you’re right. This is only the first phase of Quora integration in sidebar and the frequency and volume of Quora results will increase over time as the feature is refined. Results will also vary depending on the search query and the public answers and topics available on Quora,” Bing explained. “Social” is a supplemental service in Bing’s social sidebar, with which Bing expects social media-based friends or other public Quora experts (not necessarily from your network) will provide proficient clarifications or answers to the topic that you’ve searched for. On the other hand, Google’s seamless integration of Quora’s answers, and even Yahoo answers, is far superior to Bing’s services. Google’s search results omits the social requirements and simply grabs from Quora what Google’s algorithm believes is the best answer, regardless of whether the individual is related to your social network. As a result of Google’s Quora addition, the search engine has been an invaluable asset to the Q&A site. Google has been responsible for 50 percent of Quora’s traffic and, consequently, Quora enjoyed a growth of 350 percent year over year between June 2011 and June 2012. The Q&A site, according to comScore, sees over 1.5 million unique visitors per month. The silent success of Quora outside of its metrics have been apparent, as well. Bloomberg recently reported that Quora was expanding into a 150-person office, which is four times the number of employees that the company currently has. Edit: Digital Trends written that Quora results appearing in the Social Sidebar are solely tied to Quora content based on the Bing user’s social network. This statement was inaccurate. Bing results in the Social Sidebar recommends public answers from Quora regardless of the user being signed into Facebook. We’ve reflected these changes in the article.